This Scottish pipe tune takes its name from a village in Aberdeenshire, Northeast Scotland. “Moneymusk” comes from the Gaelic “Muine Muisc”, meaning a noxious weed or bush. The tune was apparently composed by fiddler Daniel (sometimes Donald) Dow in 1776, and first appeared in his Thirty Seven New Reels as “Sir Archibald Grant of Monymusk's Strathspey”. It quickly became ubiquitous in Scotland, Ireland, and North America. 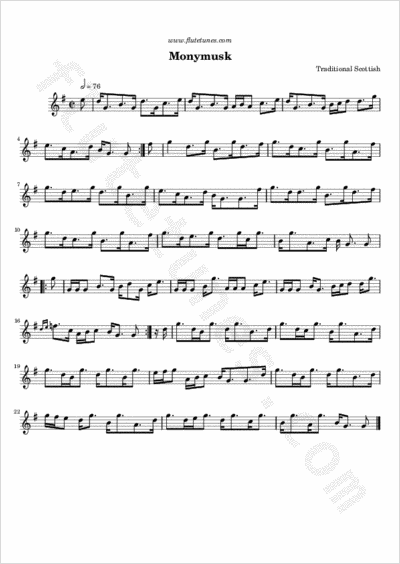 Printed versions are legion, both in the key of A and in G. Sometimes the title names not a tune but a dance, and it is often described as a tune for the “Highland Fling”, a popular dance in the Scottish fashion.